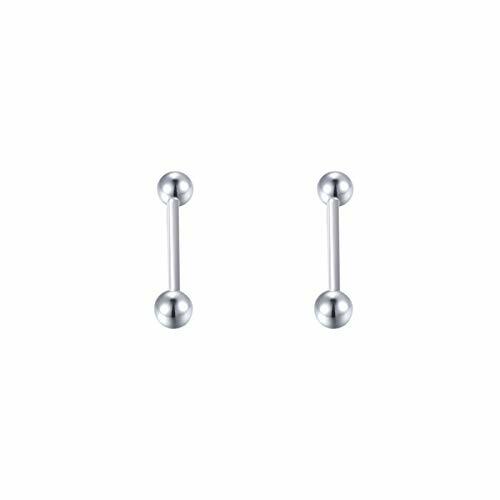 ❤ Theme❤- Classic 2 Pcs Ball tongue rings. Comfort-fit. ❤ Material ❤ - 925 Hypoallergenic Sterling Silver,Tarnish Resistant, Nickel-free and Allergy-free. ❤ Size ❤- Barbell Gauge Size 14G (1.6mm), length for the bar is 5/8" (16mm) , Soft surface. The gentle Edge of the Heart will not hurt your mouth. ❤ Package ❤- 2 * Tongue Ring , 1 * Gift Box , 1 * Cleaning Cloth ; You can send it to your friend directly. If you have any questions about this product by DAOCHONG, contact us by completing and submitting the form below. If you are looking for a specif part number, please include it with your message. 20 Pieces Mix Color Jeweled Emboss Flowers 925 Sterling Silver Nose Pin Straight End 20Gx5/16 (0.8x8MM). Pack in Acrylic Box. 20 Pieces Mix Color Jeweled Claw Set Round 925 Sterling Silver Nose Pin Ball End 20Gx1/4 (0.8x6MM). Pack in Acrylic Box.